Alban, an opposition councilman, died on Monday after being detained on Friday. Some Venezuelans are suspecting foul play after government authorities said a jailed opposition leader committed suicide on their watch Monday. Fernando Alban, an opposition councilman, was detained last Friday after returning to Caracas from New York City. Alban was accused by Venezuelan authorities of being part of an assassination attempt against Venezuelan President Nicolas Maduro involving a drone in August. Alban was being detained by the Bolivarian National Intelligence Service, also known by the Spanish acronym SEBIN, at their headquarters in Caracas. Venezuelan authorities said Alban jumped to his death from the 10th floor of the building on Monday. "He asked to go to the bathroom, and from there, he jumped from the tenth floor," Tarek William Saab, Venezuela’s Attorney General, said during an interview with Venezuelan state TV. Saab also said an investigation into Alban’s death will be conducted by two prosecutors with experience in human rights and tax crimes. But many in Venezuela suspect that Alban's death was not a suicide. Joel Garcia, Alban’s lawyer, told ABC News that Alban was a devout Catholic who would likely not take his own life. 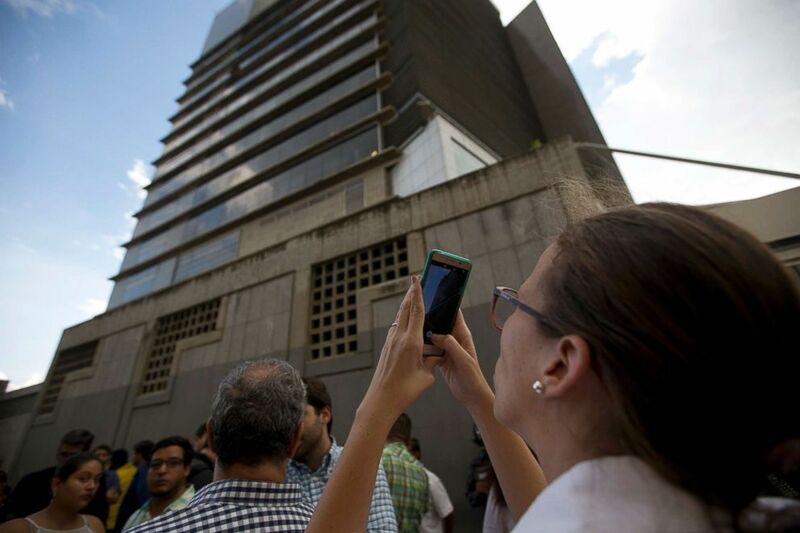 (Fernando Llano/AP) Manuela Bolivar, a lawmaker and member of the First Justice party, takes photos of the Bolivarian National Security Service (SEBIN) headquarters in Caracas, Venezuela, Oct. 8, 2018. Venezuela's Attorney General Tarek William Saab said that councilman Fernando Alberto Alban Salazar, who was arrested on suspicion of involvement in a failed assassination attempt on President Nicolas Maduro, committed suicide while jailed at SEBIN. Garcia also said that people who are familiar with the building have told him that the place where Alban’s body was found does not coincide with where the bathrooms are located inside the SEBIN headquarters. “The attorney general knows that people are tortured inside that building,” Garcia said. Suspicion of foul play grew when Nestor Luis Reverol, Minister of the Interior, Justice and Peace in Venezuela, tweeted that Alban was being transferred to see a judge when, while sitting in a waiting room, he jumped from a window, a different explanation from the one Attorney General Saab had given on national TV. Ravina Shamdasani from the Office of the United Nations High Commissioner for Human Rights said during a press briefing on Tuesday that they were concerned about the news of Alban’s death and the conflicting reports surrounding the incident. Shamdasani said detention conditions in Venezuela are concerning. Detainees are being housed in overcrowded facilities infested with rats and insects, lacking access to natural light, food and water and not being provided with medicine for those with medical conditions. “We call for a transparent and independent investigation to clarify the circumstances of his death,” Shamdasani said. Garcia told ABC News that the SEBIN building is equipped with CCTV cameras. “If they want to be transparent, all they have to do is show the videos,” Garcia said. The Ministry of Interior, Justice and Peace could not be reached for comment. ABC News' Guy Davies contributed to this report.